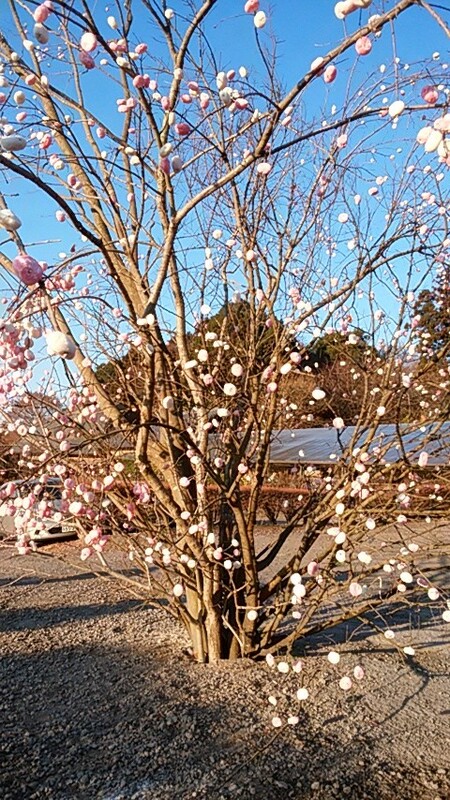 TsukuBlog | On January 15th, some will eat AZUKI-GAYU　(小豆粥) while others will wait for next month`s FULL MOON to celebrate Koshogatsu (小正月)- Most, however, will do　nothing at all ! 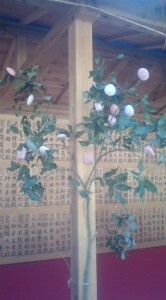 NARASE MOCHI at Tsukuba San Jinja – auspiciously colored red and white rice-cakes skewered on tree branches as a prayer for abundance in the coming year. Until 1873, the Japanese calendar, and likewise its annual cycle of events, was closely linked to the waxing and waning of the moon.In fact, if you knew the day of the month, according to that old system ( now called the KYU-REKI, the former calendar), you knew what the shape the moon would be taking in the sky that night. The full moon, almost always appeared on the night of the 15th of the month (and in the rare cases it did not – a day or two later). And because the full moon, since ancient times, had been considered to be very significant in Japan ( especially in connection with pregnancy and childbirth and the spirits of ones ancestors), the first full moon of the new year ( on the night of the 15th day of the 1st month) was celebrated by the people as KO SHOGATSU (小正月). Well, today is the 15th day of the 1st month according to Japan`s new calendar ( called the SHINREKI), and some people will be celebrating KOSHOGATSU despite the fact that there will be nothing near a full moon ( and thus no special traditional significance). Others , however, myself among them, will be waiting for March 3rd this year (2018) which will be Ko Shogatsu according to the old calendar. No matter when you plan to celebrate Koshogatsu ( if you do at all!) you will have to know what this requires. Others might be curious about the special decorations that they see around January 15th ( according to the new AND old calendars). Let me explain bit: Over the years there have been many customs specific to KO-SHOGATSU, which like OH-SHOGATSU ( the New Year`s Festival of the 1st day of the first month), was celebrated for a three day period. Few of these customs survive, and those that do are, in fact, just barely hanging on. 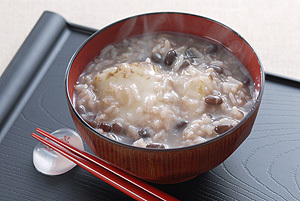 It used to be common to eat rice gruel with azuki beans on Ko-Shogatsu (this custom is even mentioned in Sei Shonagon’s Heian Period classic The Pillow Book — Makura no Soshi, in the Tosa Diary of Ki no Tsurayuki – though they called it MOCHI GAYU, 望粥ー full-moon porridge). I have met very few people who still do this today. In fact I did a little survey today, and in Tsukuba, most of the people I asked had never even heard of KOSHOGATSU, let alone eaten azukigayu for the occassion. Who knows though, the custom might make a comeback in the future someday if promoted by supermarkets and/or convenience stores. 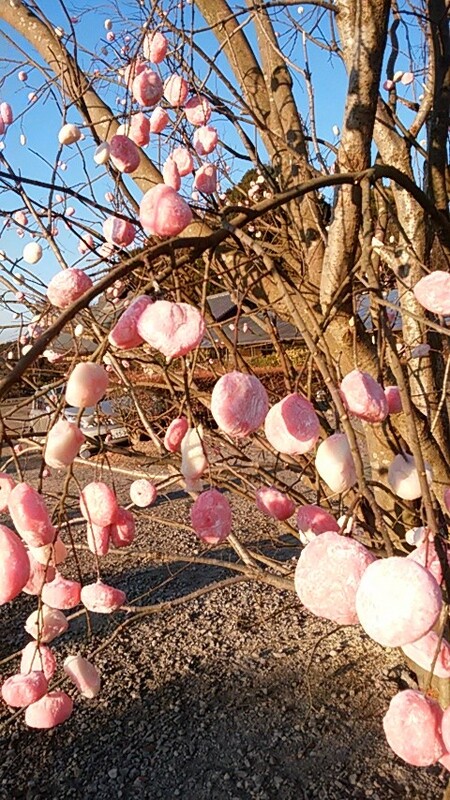 It is more common,however, to see trees with pink and white mochi rice cakes stuck on the tips of their branches, especially at and around Asakusa’s Senso-Ji Temple (though these are artificial). Mayu-dama : little red and white balls symbolizing rice-cakes or silk-worm-cocoons stuck on tree-branches as a prayer for fertility and abundance. 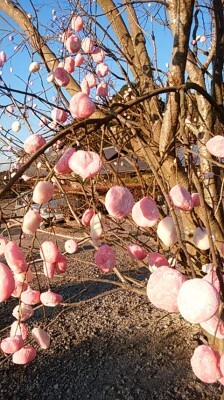 These decorative trees are known by different names depending on the region you are in and in Ibaraki they are often called NARASE-MOCHI, which could be translated as- rice cakes for abundant crops (NARU means to bear fruit), while in Asakusa the same trees decorated with plastic balls are called MAYU-DAMA (繭玉, cocoon balls), which are set up in hope of an abundant silk harvest, which harkens back to the days when silk was Japan’s most important foreign currency earner. If you wait until next month (the old Koshogatsu), there is an event held on Mt Tsukuba (the TOSHIKOSHI-SAI) that I recommend you check out. 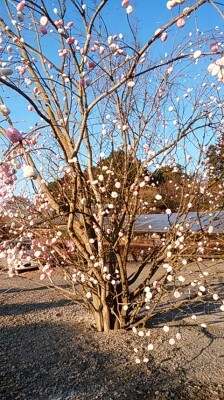 I have written about it for Tsukublog and in that same piece discuss Koshogatsu in more detail here. And though you might not see any evidence of KOSHOGATSU ( take a peak into a kindergarten or daycare center, they might have the NARASE MOCHI decorations), the way the day was once ( and still is, though rarely) celebrated is quite interesting. Once again we can see a ritual meal which is served with the intention of separating sacred time (HARE, ハレ) from mundane time (ke, ケ), as we have just seen last week with the NANA GUSA KAYU. It is on the 15th that the New Year`s decorations will be burned, with the smoke which rises up from the blaze representing the Gods of the New Year ( Toshigami-Sama) returning to their ususal abode after having spent two weeks among the people who welcomed them. This was traditionally done after families had eaten azukigayu. Apparently it was also common for farming families to somehow predict the outcome of the current year`s harvest using this porridge. One more point of interest is that I found scouring some obscure texts at the library. I found out that it was long the practice in Japan called KAYU TSUE (粥杖) in which young men with sticks would chase young women on koshogatsu and rap them on their bottoms. This was done for fertilty and to ensure healthy and robust offspring- reminding us that the full moon had always been strongly connected with pregnancy. When I read this I could not help but think of other spring festivals in which similar rituals took place- including the great Roman festival of Lupercalia, which just might be the ancestor of what is now Japan`s most popular spring festival – Valentines Day. Dont forget that Ko shogatsu was also traditionally held around the same time of year. It struck me as funny, when later in the day today, while talking about koshogatsu with a Japanese friend, she said: it will never become popular, and will not be promoted by the companies. It would be competing with Valentines Day! But dont you think there is always room for one more spring fertility rite?! Kosyougatsu, I have heard term but never done anything special, also when I was 20 I never heard Valentine Choco, so I might missed many V-day Chocos from countless girl friends! Full moon, I like and several times with my late naughty Dog Gonta I had howled toward full moon: “call of the wild”. I have been enjoying beautiful clear night sky of winter in Tsukuba. To compare sky of Tokyo we can watch so many twinkling stars here. In my mind I have given stars to my family and to** as my sincere presents, Subaru (昴：Pleiades) for my dearest wife, Orion for myself, Cassiopeia for Htsukoi-no-hito (初恋の人：the first lover),Taurus for elder daughter, The Driver for second daughter, and the Twin for my son・・・like that. No need of spending fortune, still are very splendid gifts, stars!! Winter is the best season for me, snow, and clear sky to view mountains! And no need of beer which I have to drink in summer. Any way I like Oshiruko-mochi very much,I would like to eat it at Kosyougatsu this new year after hot Sake-drink(燗・寒酒). Chinese New Year lasts for 15 days in my country. The 1st, 9th, and 15th day are the important days of celebration for the Buddhists and Taoists. 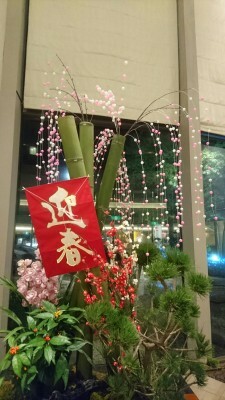 Come to think of it, since Chinese New Year falls on Feb. 3rd this year, don’t you think that koshougatsu is related to the 15th day of Chinese New Year i.e. Feb 18th?